Nahville, a.k.a. "'Music City" was the summer wedding destination for our two city friends and my was it a rocking time. My husband and I arrived a day early and did a little grubbing and exploring. Armed with numerous restaurant suggestions, we jumped right to it. Below are photos and details of our Nosh-ville journey, Part 2 of the Nashville wedding details to follow. 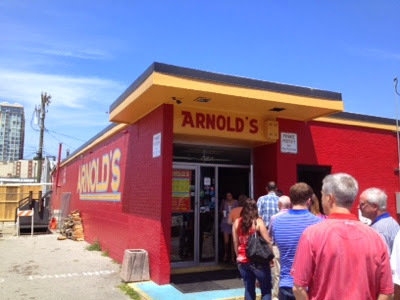 First stop was reknown Arnold's Country Kitchen in "The Gulch" area; a cafeteria-style haunt boasting classic southern comfort food (think pork BBQ, roast beef, chicken livers), collard greens, corn bread, mac n' cheese, banana pudding, pies, and sweet tea. Yup, I think I ate it all. Tourists, beware, this stop is only open Monday - Friday 6:00 a.m. - 2:30 p.m. And you know a spot is solid when it can demand these hours and turn away weekend visitors. After exploring "The District" downtown Nashville, perusing cowboy hats and boots (who knew cowboy boots cost $500?! 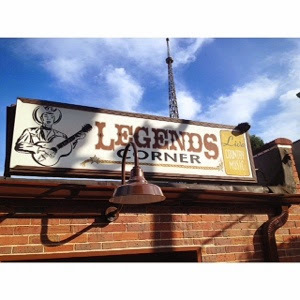 ), the evening started with a stop to cheers the bride and groom at Legends Corner on Broadway while enjoying some live music. 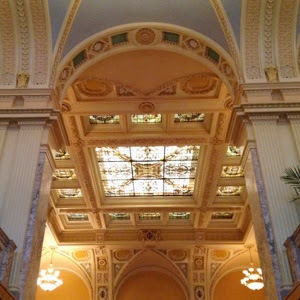 We then ventured to the Capitol Grille at the Hermitage Hotel, a historic five-star hotel with impressive classic and decor and easy going elegance. The restaurant, downstairs from the hotel offers a southern-influenced sustainable menu all with local ingredients. The Executed Chef is aptly titled "Farmer" as well, growing vegetables five miles down the road. The next morning, we ventured to the renown Pancake Pantry, a classic a Nashville tradition since 1961. After a waiting in a line around the corner (quite common), we dug in to the must-order pancakes, in our case, sweet potato pancakes with real sweet potato in the batter topped with cinnamon cream syrup. After the wedding (Part 2 coming), we needed one last - but needed - stop before returning home. I had visited McCradys in charming South Carolina and had one of my favorite meals and Husk Nashville is part of the same award-winning Neighborhood restaurant group. What a stop it was. I still dream about the biscuits and gravy. Check out the Nashville wedding details up next.